NYT: "Bandar Bush Not Reliable - Who Knew?" WASHINGTON, April 28 — No foreign diplomat has been closer or had more access to President Bush, his family and his administration than the magnetic and fabulously wealthy Prince Bandar bin Sultan of Saudi Arabia. 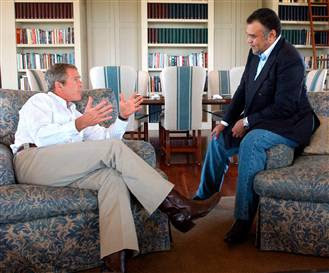 Prince Bandar has mentored Mr. Bush and his father through three wars and the broader campaign against terrorism, reliably delivering — sometimes in the Oval Office — his nation’s support for crucial Middle East initiatives dependent on the regional legitimacy the Saudis could bring, as well as timely warnings of Saudi regional priorities that might put it into apparent conflict with the United States. Even after his 22-year term as Saudi ambassador ended in 2005, he still seemed the insider’s insider. But now, current and former Bush administration officials are wondering if the longtime reliance on him has begun to outlive its usefulness. Bush administration officials have been scratching their heads over steps taken by Prince Bandar’s uncle, King Abdullah of Saudi Arabia, that have surprised them by going against the American playbook, after receiving assurances to the contrary from Prince Bandar during secret trips he made to Washington. For instance, in February, King Abdullah effectively torpedoed plans by Secretary of State Condoleezza Rice for a high-profile peace summit meeting between Prime Minister Ehud Olmert of Israel and the Palestinian president, Mahmoud Abbas, by brokering a power-sharing agreement with Mr. Abbas’s Fatah and Hamas that did not require Hamas to recognize Israel or forswear violence. The Americans had believed, after discussions with Prince Bandar, that the Saudis were on board with the strategy of isolating Hamas. American officials also believed, again after speaking with Prince Bandar, that the Saudis might agree to direct engagement with Israel as part of a broad American plan to jump-start Israeli-Palestinian peace talks. King Abdullah countermanded that plan. Most bitingly, during a speech before Arab heads of state in Riyadh three weeks ago, the king condemned the American invasion of Iraq as “an illegal foreign occupation.” The Bush administration, caught off guard, was infuriated, and administration officials have found Prince Bandar hard to reach since. Mr. Bandar, son of one of the powerful seven sons born to the favorite wife of Saudi Arabia’s founding king, “needs to personally regroup and figure out how to put Humpty Dumpty together again,” one associate said. Robert Jordan, a former Bush administration ambassador to Saudi Arabia, said the Saudis’ mixed signals have come at a time when King Abdullah — who has ruled the country since 1995 but became king only in 2005 after the death of his brother, Fahd — has said he does not want to go down in history as Mr. Bush’s Arab Tony Blair. “I think he feels the need as a kind of emerging leader of the Arab world right now to maintain a distance,” he said. Toadying has its limits, clearly.